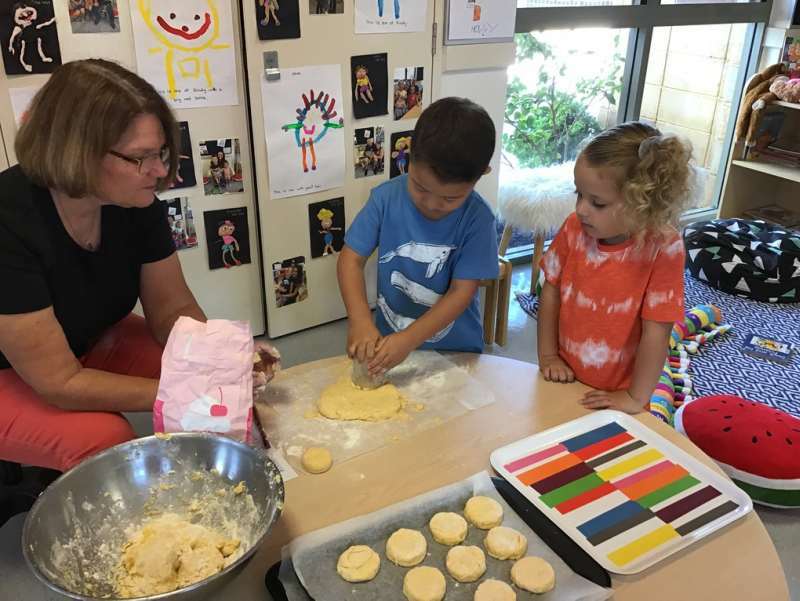 In Kindergarten this term, our Religious Education focus is ‘I am Special’. 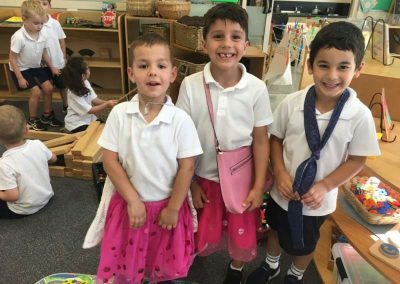 We have been exploring who we are, what we like, our special gifts and why God has made us all unique. As the term has progressed, we have discussed ‘Families’ and ‘New Life’. Our focus on families has outlined the roles we have at home to live in a peaceful environment in order to live as Jesus did. 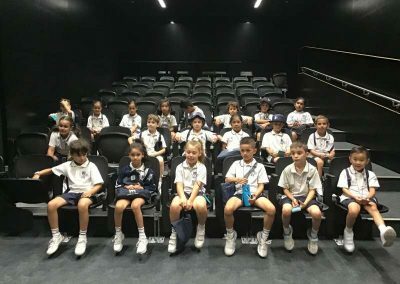 Our English focus has been to develop the children’s oral language skills and their confidence to share their experiences, feelings and ideas with the teachers and their peers. In Writing our focus has been on name recognition. 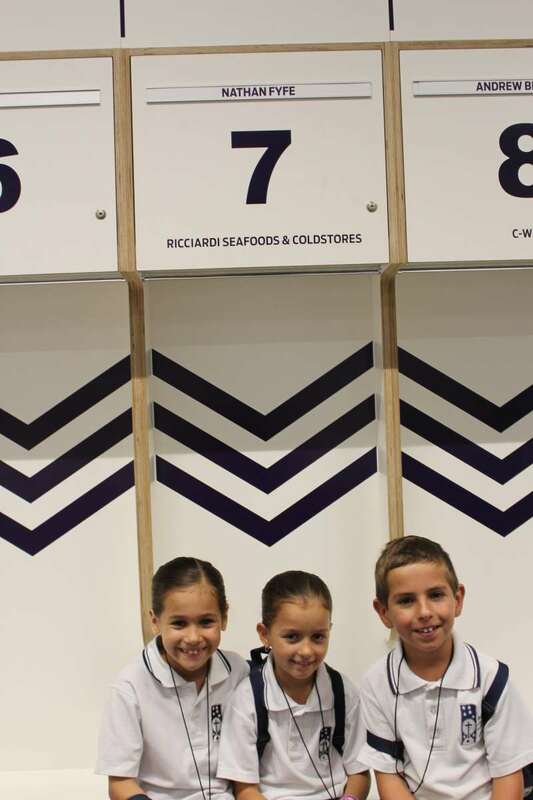 We are proud to say that most children recognise their names in the morning on the self-registration board. 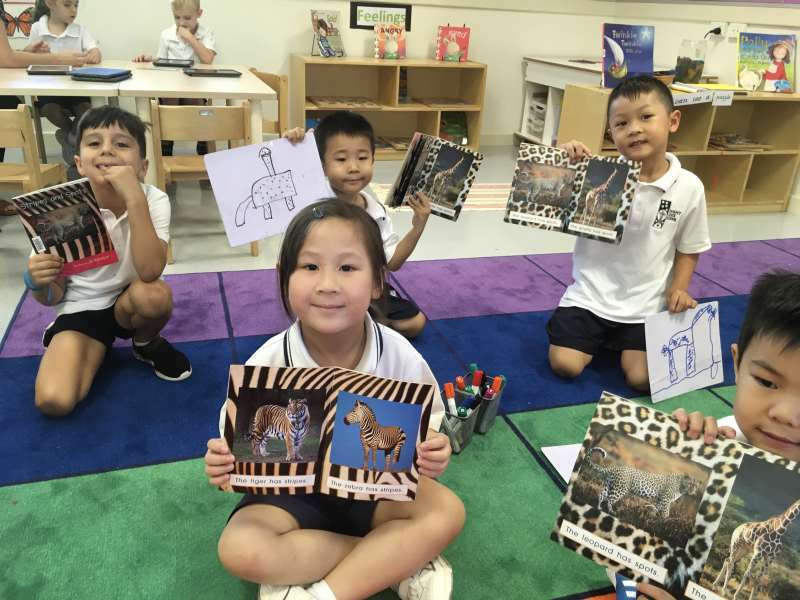 During shared reading, we have emphasised text concepts such as the title, author and illustrator of the book, and focused on print concepts including left to the right print direction. 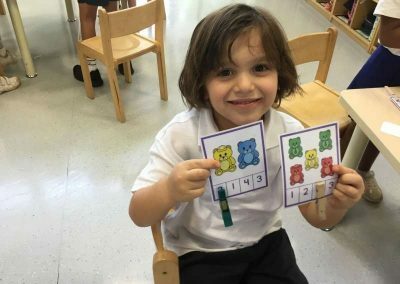 In the area of Mathematics, we have focused on measurement, patterns, counting using one-to-one correspondence and number recognition. 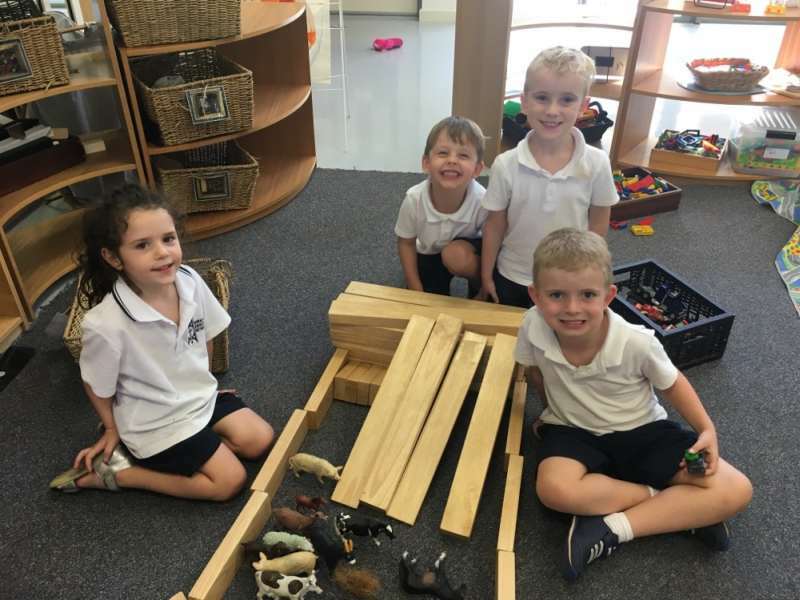 We have introduced different forms of measurement by measuring the height of the children using standard and non-standard units, including the length of their footprint. 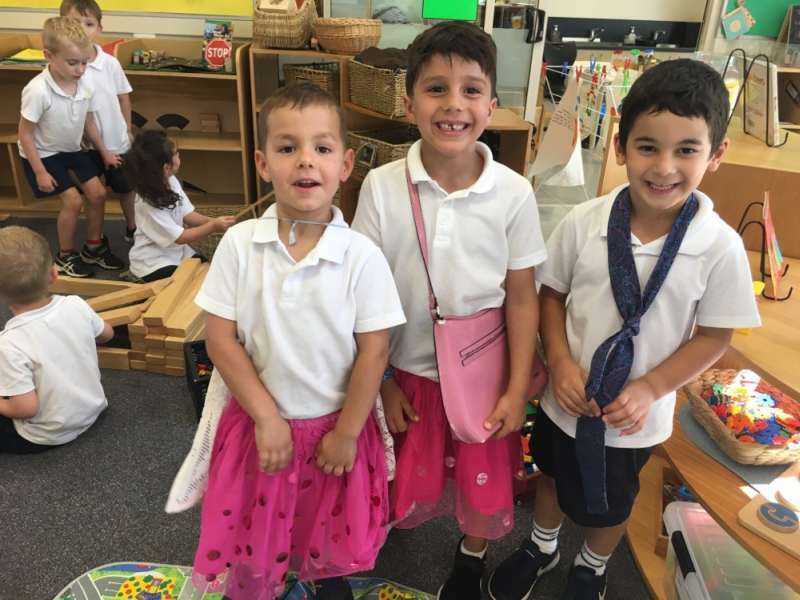 Over the past seven weeks, starting Kindergarten has provided many new experiences for the children which have brought about many emotions. We have been exploring these different emotions and how we can show these emotions in appropriate ways. For example; if we are happy, we can smile at others, if we are tired, we can have a rest, if we are angry, we can move away from others and have time to calm down. 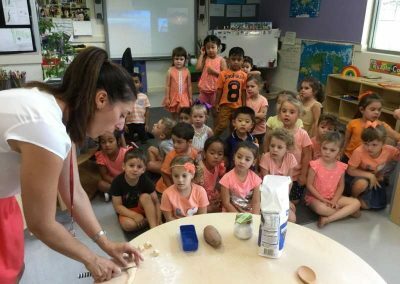 Our work with emotions has led us to look at how we can care for our bodies, so we are healthy and feel good. Eating the right food, getting enough sleep, keeping ourselves clean and having regular exercise will help us feel happy and energised. In Week Four, as part of our ‘New Life’ learning, we hatched butterflies in a special box. 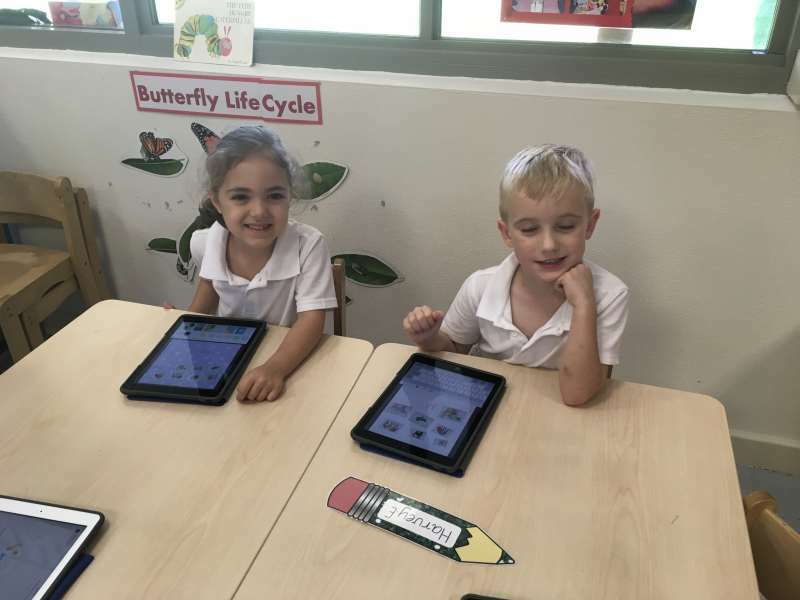 The children observed the caterpillar developing and the process of metamorphosis (changing from pupae (chrysalises) to butterflies). 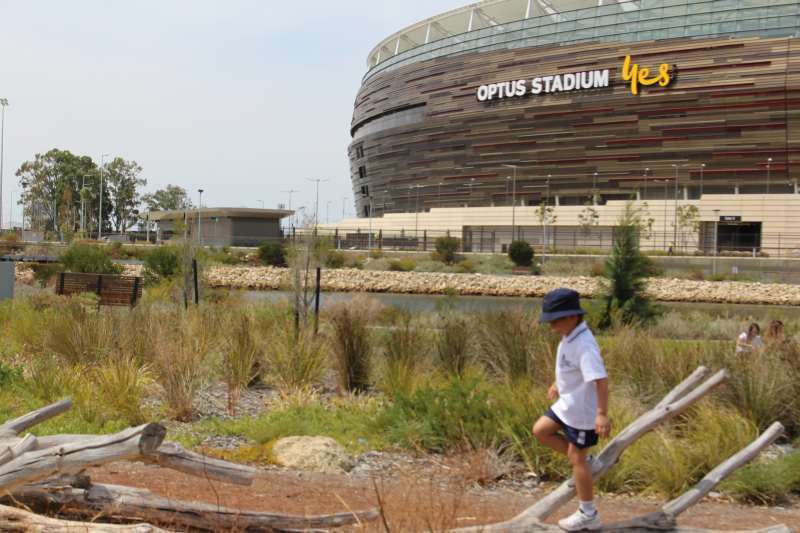 This experience nurtures the children’s curiosity, wonder and awe as it focused on new beginnings and new life. The children enjoyed watching the changes, naming the butterflies and releasing them into their natural environment. 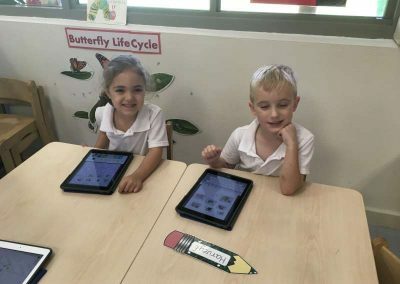 We were amazed at how accurately the children sequenced the life cycle of the butterfly, their detailed drawings and collages of their observations and their impressive recounts of how the caterpillars changed into butterflies. Currently, we are learning about family diversity, Jesus and ‘New Life’ at Easter. 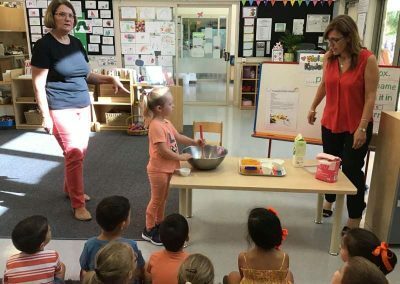 These topics will continue until the end of the term as we explore Harmony Day, the washing of the feet and The Last Supper which highlight the friendship Jesus shared with his disciples. Jesus included all people in his life and for this reason we look at Jesus as our model in our own friendship here at school. We have had a very busy and eventful term learning and exploring how we live at Kindy and all the learning experiences that have come with it. 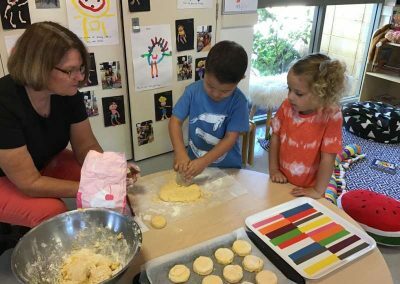 The Pre-Primary children have settled in very well to full-time school over the last seven weeks. 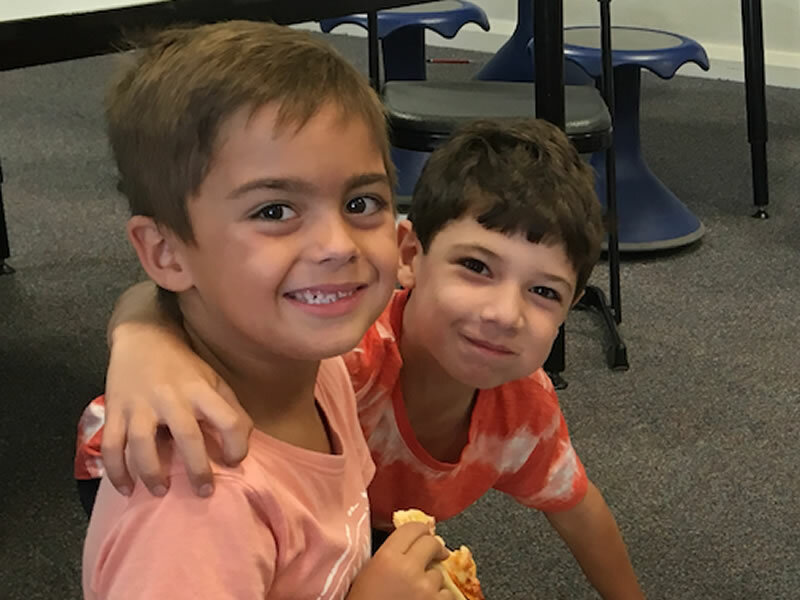 It has been a big transition for us and we love that we get to come to school each day and see all of our friends. Each day is a new day that brings lots of new learning and experiences. 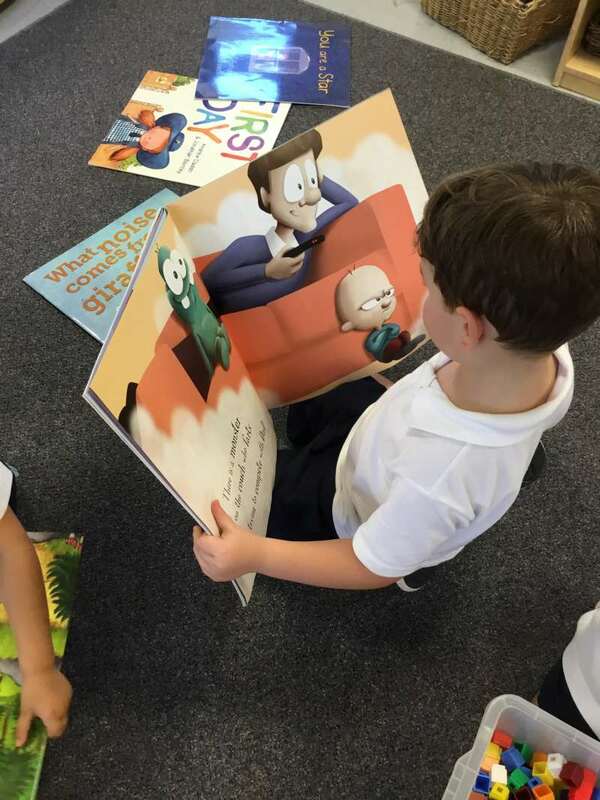 In Religious Education, we are currently focusing on feelings. We have been building our understanding and knowledge of what feelings are and how to recognise these feelings in ourselves and others. As the term progresses, we will explore ways to manage our feelings and how our feelings can be expressed in loving ways. 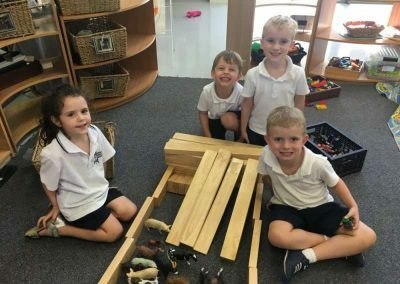 In English, we are constantly developing our oral language and communication skills through a variety of planned and spontaneous activities such as role play and retelling stories. We have also begun learning new sounds each week using the Soundwaves Program and have enjoyed learning the chant and action for each sound. 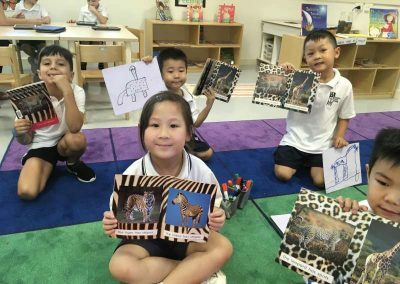 In Pre-Primary, we always try our best and we have been working hard to develop our awareness of words. 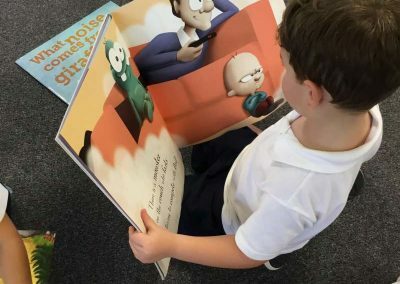 We focus on hearing sounds in words, recognising the letters that make these sounds and attempting to have-a-go at writing. This term in Mathematics, we have been developing our understanding of numbers from one to ten; through counting, recognising numerals and identifying quantities. 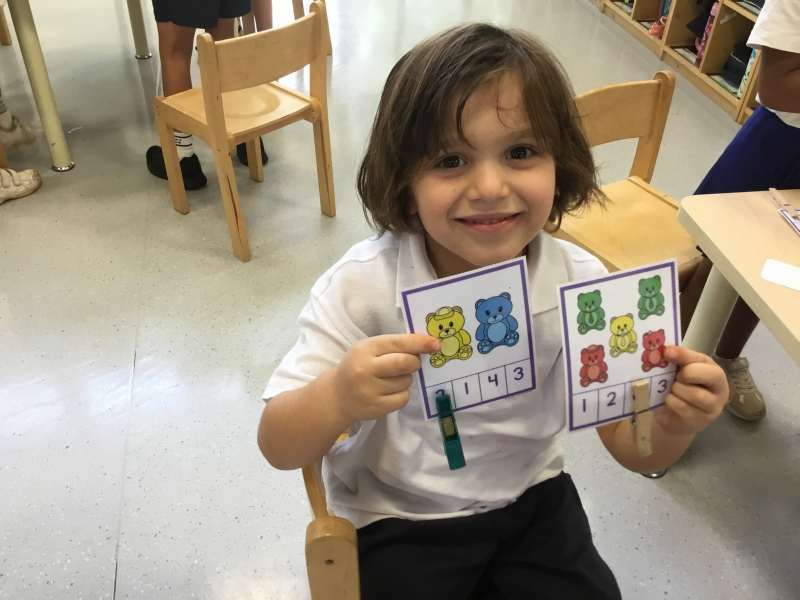 We have also been practising our counting skills; counting forwards and backwards from ten and using counting skills such as one-to-one correspondence to count groups of objects. Each morning, our calendar helper works out what the day, date and weather is. 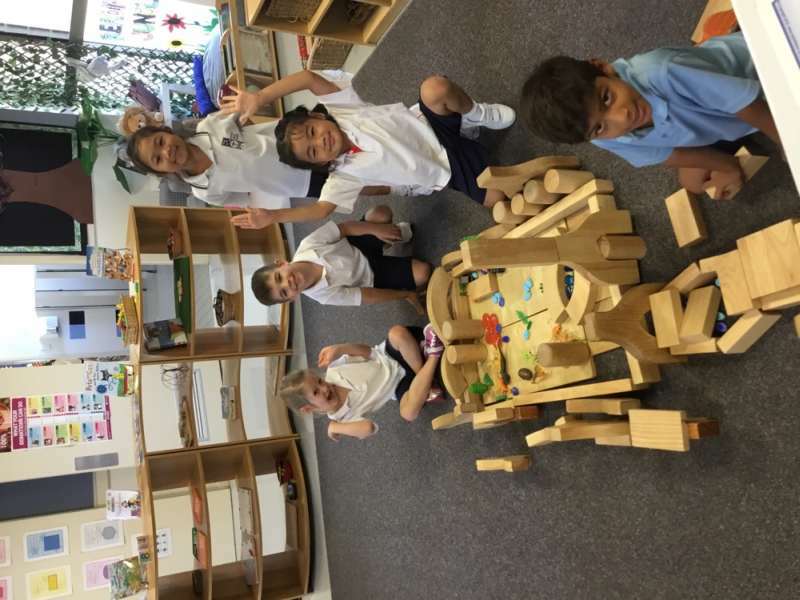 We are excited to continue learning about new mathematical concepts throughout the year such as two-dimensional shapes, patterns and measurement. 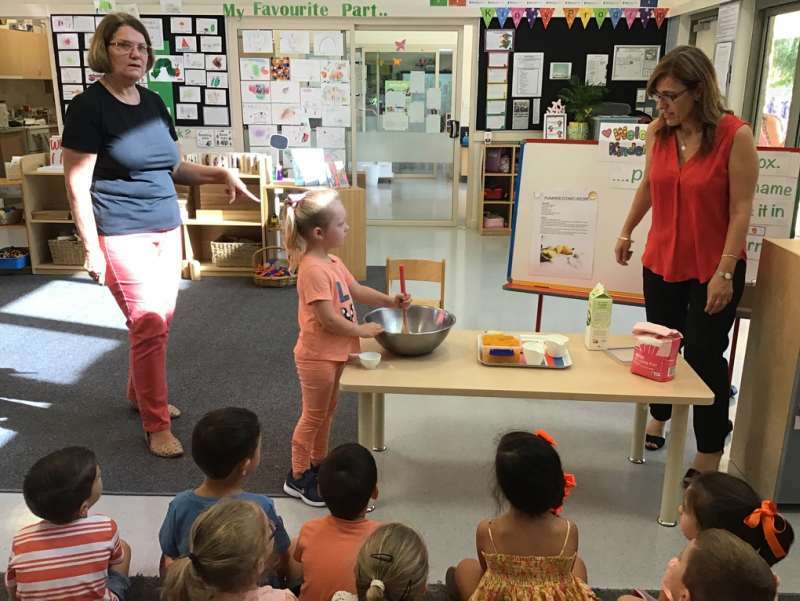 In our Health program, we have also been exploring ways to become healthy, safe and active members of our community. We have identified our personal strengths and how we can use these strengths to help ourselves and others. We are becoming more aware of our emotions and those of others by recognising physical responses and body language. We have also learnt appropriate language and actions to communicate our feelings in different situations. 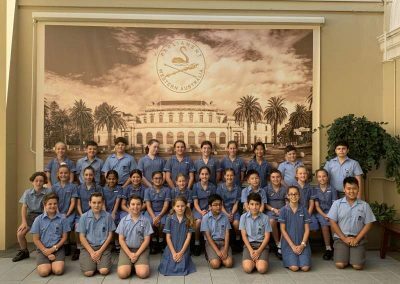 In HASS, we have discussed our personal and family history, listed the people in our families, where they were born and how they are related to each other which was then represented on a simple family tree. We have also begun exploring world maps and studying the globe. 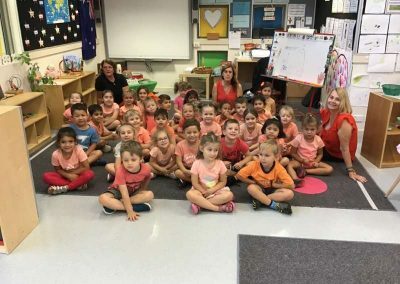 We are able to locate Australia and other familiar countries and have discussed why some places are special to people and how they can be looked after. This term in Science, we have been looking at the needs of animals, plants and people. We were able to observe the hatching of a cocoon and watched as it turned into a butterfly. Through caring for our caterpillars and cocoons, as well as growing seeds, we will observe first-hand how to meet the needs of animals and plants and consider the consequences of their needs not being met. We have really enjoyed coming to the iLab this term for our STEAM sessions and learning more about working with the iPads. We have discussed rules for online safety and acceptable behaviour while using our devices. We have become expert photographers and have practised basic editing skills. We have also had the opportunity to explore a variety of different creation apps and integrated these into our classroom learning. Body Management Skills such as balancing, stopping, landing, turning, stretching and dodging. Locomotion Skills such as walking, running and leaping. 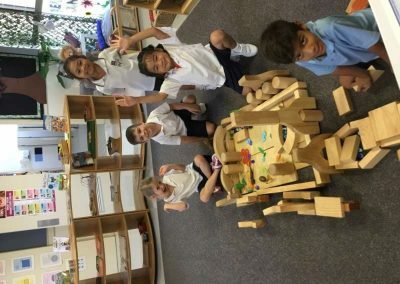 We are also provided with a number of opportunities to work collaboratively, follow rules and problem solve through games and physical activities. 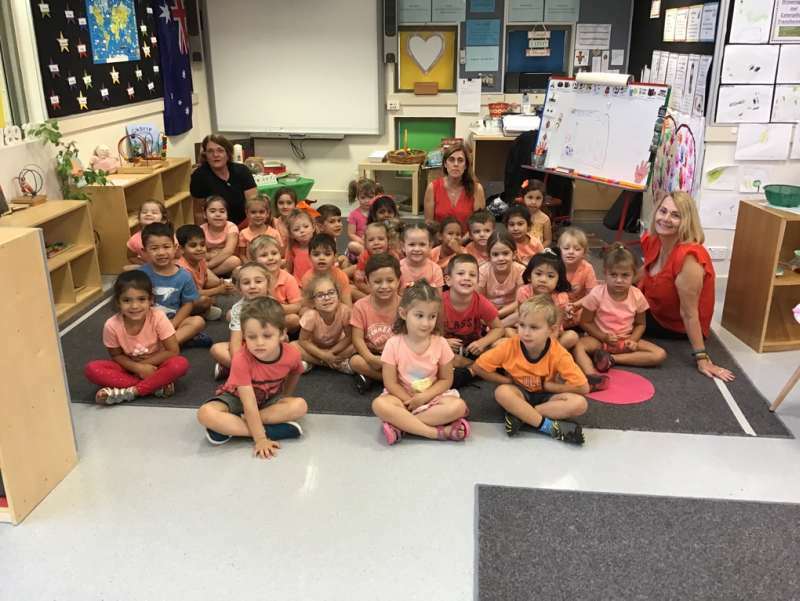 In Music, Miss Condipodero has been working with us to develop our intonation and aural skills, discover our singing voices, and develop an understanding of high and low pitch through singing and building a wide repertoire of songs. We have focused on aurally and visually recognising the simple ‘so, mi’ interval of the pentatonic scale using solfa and solfa hand signs and developed our understanding of beat, and simple rhythms through visual and aural recognition, improvisation, songs and untuned percussion instruments. It has been a busy term so far and we have enjoyed each moment. 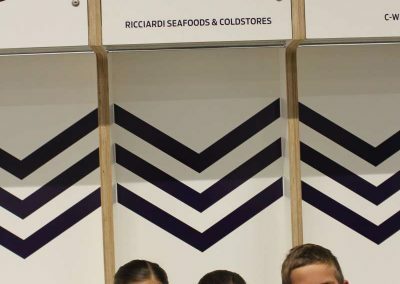 We can’t wait to see what will come next! 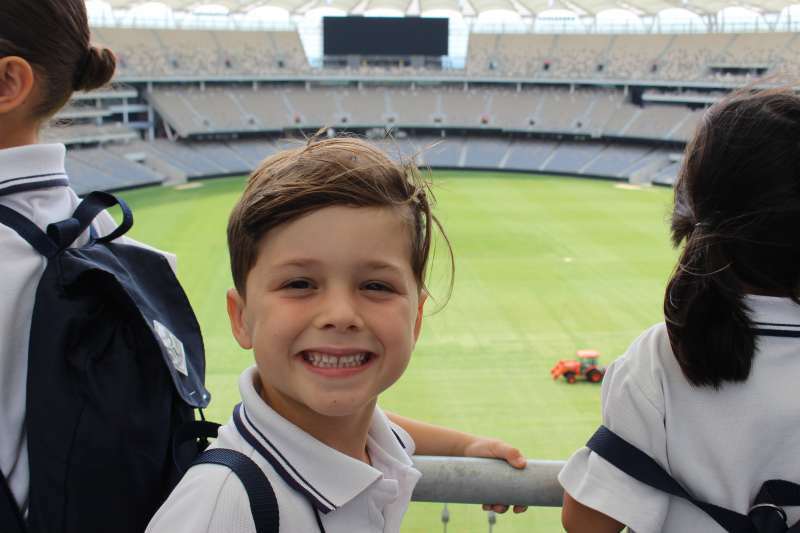 On Tuesday 5 March the Year Two children went to Optus Stadium. We decided to visit Optus Stadium because we have been learning about how places change over time and how different places can be special to different people. 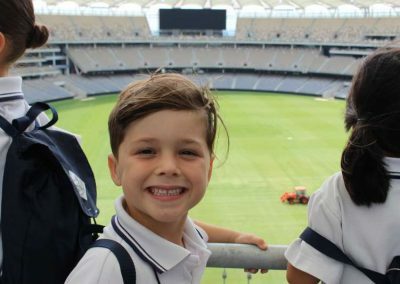 We were very excited to hop on the bus to journey over the tunnel to Optus Stadium. 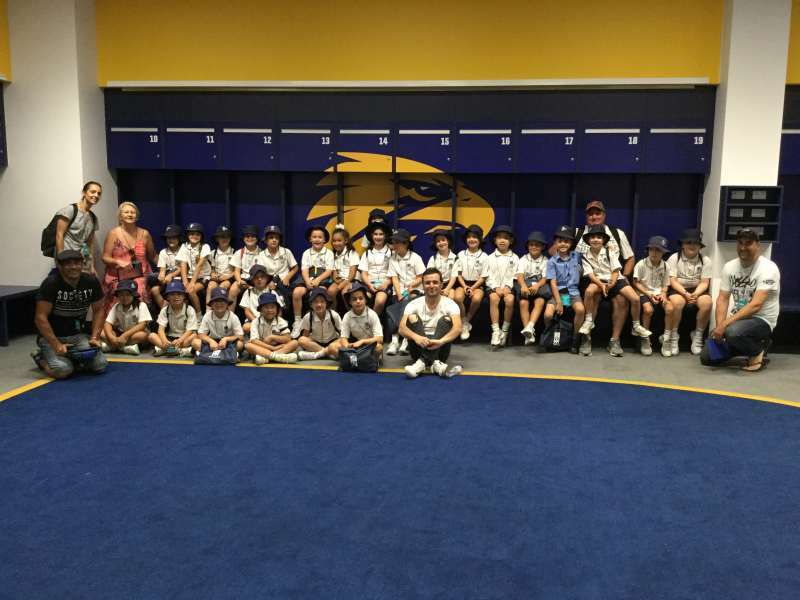 When we arrived we were split into groups and began our behind-the-scenes tour of Optus Stadium. 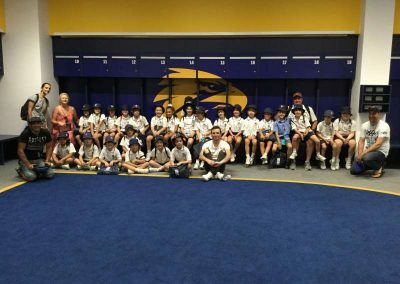 We visited the changerooms of the Eagles, Dockers and Scorchers. We got to walk out into the vomitorium and look at the field. We even got to travel in the private elevators and visit the exclusive Sky Bar. 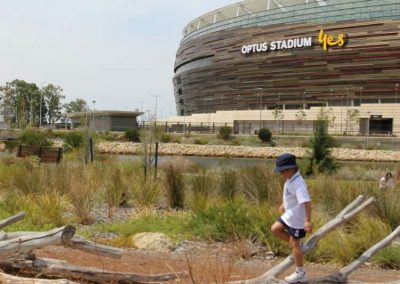 We learnt that the land that the stadium was built on was Indigenous Burial ground, then it became a farm, a sewerage filter, a cement plant and a golf course before it was Optus Stadium! 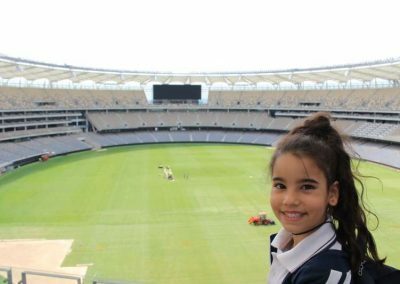 After the tour, we walked around the stadium looking at the Swan River. 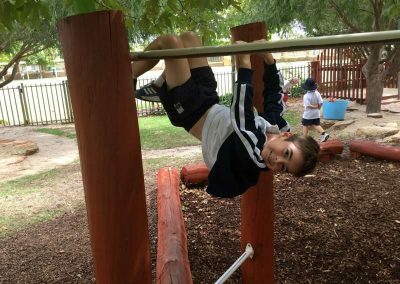 We visited the different playgrounds which were named after the different Indigenous Australian seasons. 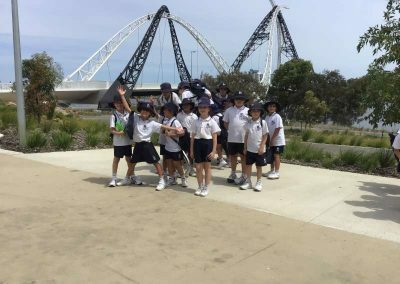 We walked over the Matagarup Bridge. We loved our excursion and learnt so many different things about how the grounds of Optus Stadium have changed over time. 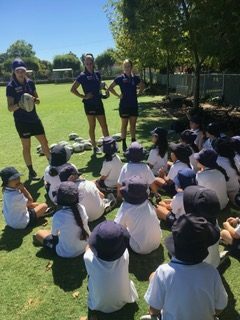 Last Tuesday our Year 2 & Year 3 children took part in the ‘Let’s Go Freo’ program. 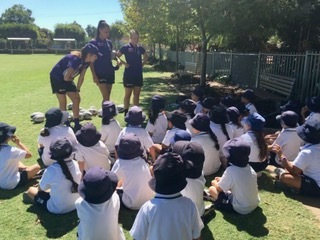 The children were greeted by three Fremantle Dockers players from the AFLW – Philipa Seth, Gemma Houghton and Jasmine Stewart. 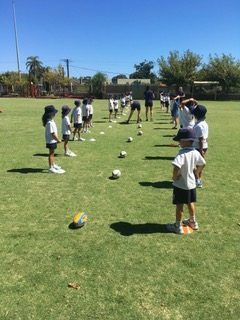 Through a series of fun games, the players taught the children how to correctly kick, mark and handball. 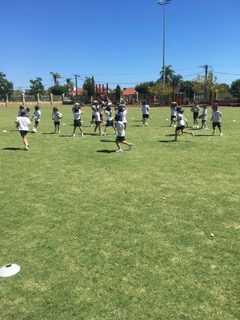 To finish, the children were able to play a game that required them to kick the football as far as they could while their partner counted how times they ran to a cone and back. 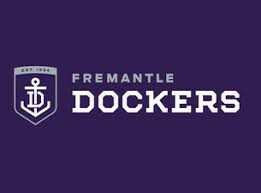 It was great spending some time learning these valuable skills and we wish the AFLW Fremantle Dockers team all the best for the finals! 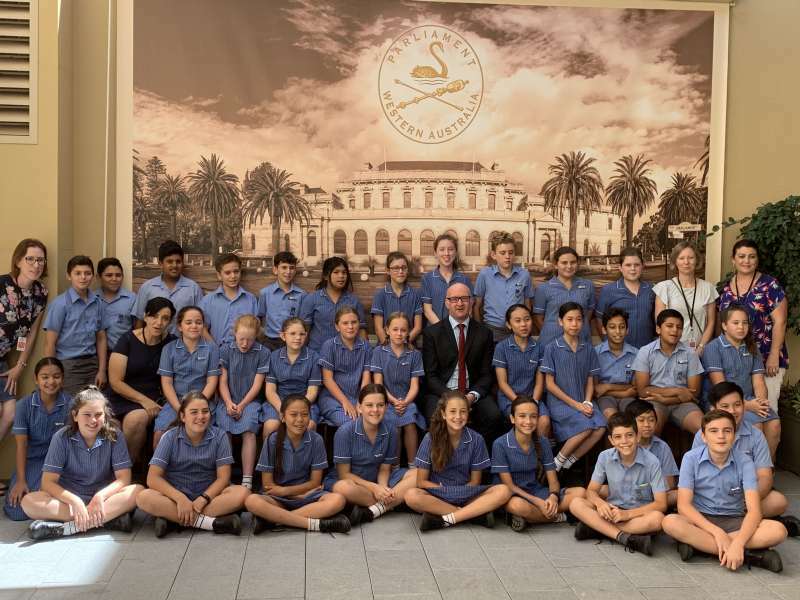 On Monday 18 March, the Year Six children were fortunate enough to visit Parliament House. We learnt a lot about the State Parliament and Federal Parliament and we even got to role play the ‘Animal Welfare Bill 2001’ in the Lower House. 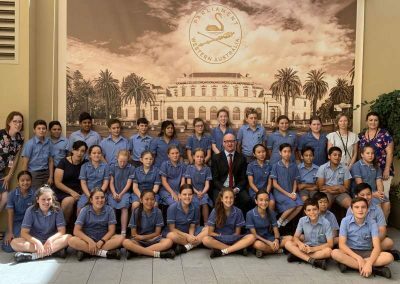 We were even lucky enough to meet Simon Millman, who is the Mount Lawley member of the State Government. 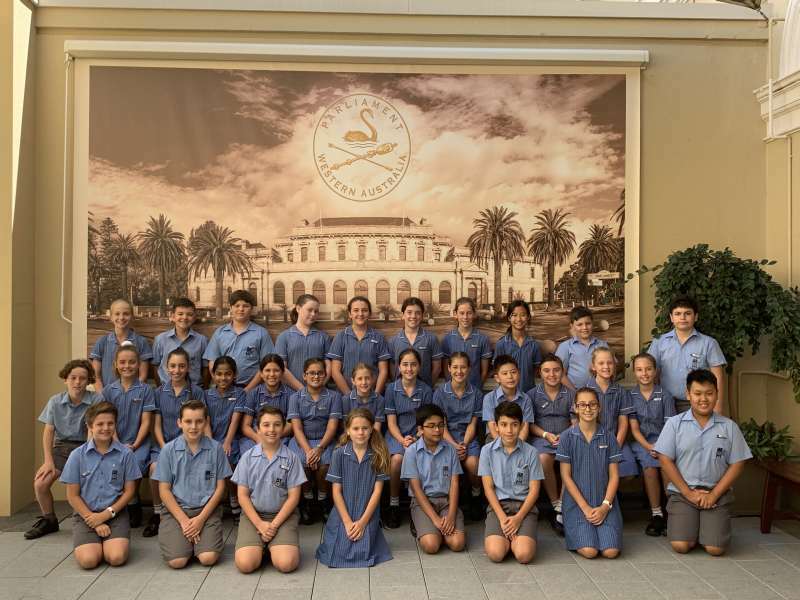 We would also like to thank our teachers, Mrs Babac, Mrs Scoble and Mrs King for preparing this exciting excursion. These students met together for their first official Ministry Meeting of the year on Monday 11 March. 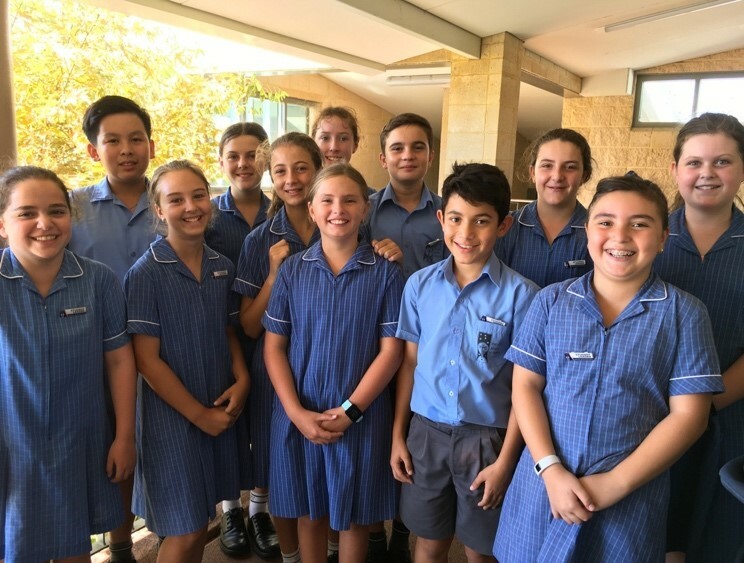 They presented themselves with great enthusiasm for what they may be able to achieve and were very happy to have been selected for the Pastoral Care Ministry as one of their priority choices. At this meeting, their first task was to come to an understanding of what Pastoral Care meant and the expectations of what they can achieve during their ministry term. They were able to give many relevant answers to questions posed to them and they were obviously drawing on their understanding of what it means to be pastoral – stepping beyond themselves and thinking of others in the wider community including the needs of the global community. They were also very familiar with the work of Jesus in His ministry and were keen to mirror these gospel values to others in their endeavours. I am very much looking forward to working alongside these students in their ministry work this semester, by guiding and supporting them in their ventures to promote care and respect for all and to provide hope for those in need.